In the 2018 Mood of the Boardroom survey, CEOs were asked: Does the Coalition Government have a co-ordinated plan of action focused on raising New Zealand’s economic performance? “No” said two-thirds (67 per cent) of survey respondents. Just 7 per cent said “Yes”; 26 per cent were unsure. On October 25, 2017 Robertson became Minister of Finance at the formation of the Coalition Government, having held the shadow finance portfolio for three years under Labour leaders Andrew Little and Jacinda Ardern. In his first budget, delivered on May 18, the Government’s finances showed a forecast surplus for 2018-19 of $3.7 billion, up from the half-yearly forecast of $3.1b, rising to more than $7b by 2021. Treasury forecast economic growth up marginally, averaging 3 per cent a year over five years. Robertson said the reports showed how well the Coalition Government managed costs and that it had stuck closely to the requirements in the Budget Responsibility Rules. These figures undoubtedly contributed towards fiscal discipline topping the Government’s top performance metrics, as rated by CEOs in this year’s survey. 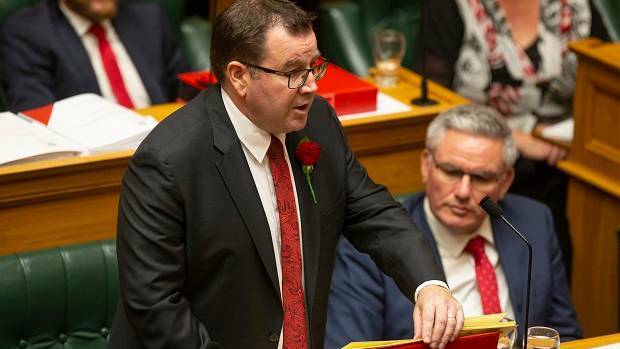 Robertson delivered a significant boost to public services, including $3.2b extra for health services over four years, a large-scale state house building programme, and an extra $1.6b for education. He said public services had been underfunded for too long. But some survey respondents are nervous the social transformation the Coalition Government is undertaking could be to the economy’s detriment. “Currently the Government is more focused on income distribution and increased support for those in need, than the economic performance needed to fund this,” says a chief executive from the media industry. What more should be on Robertson’s agenda? On the Future of Work, Westpac’s David McLean says: “In our industry the future of work’s going to be a big issue… The Government has done quite a lot of work on the future of work but I think you’re right, we need to now get together and actually turn that into practice. “Stop government wastage. Policy has been OK but the execution has been awful,” says Paul Glass of Devon Funds Management. Eight respondents were hesitant to add anything further to Robertson’s agenda — suggesting he has enough on his plate. “I think Robertson is one of the standout performers in this government. He is doing everything he should be doing — he is not creating the issues,” responded Mai Chen of Chen Palmer. “Grant has to put on his big boy pants and work on our future. Focus on getting everyone housed and fed, and a good education. Finance Minister Grant Robertson’s self-imposed budget responsibility rules have come under criticism for imposing unnecessary funding constraints on a country which faces a large infrastructure deficit. The rules put fiscal constraints on the Government, including a commitment to get net core Crown debt to 20 per cent of GDP by 2020 and keeping core Crown spending at roughly 30 per cent of GDP — figures that have been deemed “arbitrary” by economists. “We have made this commitment to ensure that future generations of New Zealanders are in a position to be able to respond effectively to any shocks — natural or economic,” Robertson told a Westpac business breakfast earlier this year. Respondents to the Herald’s Mood of the Boardroom survey have mixed feelings on whether Robertson should drop his commitment to the Budget Responsibility Rules: while 55 per cent say he should keep the rules in place, 21 per cent say he should drop them, 25 per cent are unsure. Many of those in agreement with the rules feel that Robertson’s insurance against shocks is justified: “In the next year or two we will experience a cyclical downturn, therefore it is important we keep our powder dry and have headroom to increase debt to soften the downturn when it comes — because it will,” says a blue-chip company chair. Others say the restraints are helping to build credibility in the Government. “It is one of the key factors giving Labour the perception of understanding the business sector,” says an executive in government relations. New Zealand’s need for massive spend in key areas — particularly infrastructure — was the main reason given to justify scrapping the rules. “If the spend was on building infrastructure then definitely yes — Robertson should lift the cap. The debt should be amortised over the life of the asset,” says the chairperson of a professional services firm. Robertson has asked Treasury for advice on alternative mechanisms to fund infrastructure. Survey respondents were decisive: 79 per cent feel that entities like the the NZ Super Fund, ACC, iwi and KiwiSaver Funds should be encouraged to invest directly in new infrastructure; 14 per cent said no, 7 per cent were unsure. This question generated enthusiastic responses: “YES YES YES! !” responded one executive. “Especially considering that we have restrictions on overseas investment in strategic assets — these entities should be directed to invest a minimum amount in new infrastructure,” added another. Though many included the caveat that the investment case would need to stack up. In light of recent revelations that the Government has borrowed $6.5 billion through Crown entities NZTA and Housing NZ — which did not show up on core government net debt metrics — CEOs were asked: Do you approve of Housing New Zealand and NZTA leveraging their own balance sheets to acquire funds for new infrastructure investment? 64 per cent responded yes, 21 per cent said no, and 15 per cent were unsure. Those in agreement suggested this would put the accountability closer to the decision-makers — “but it would need transparency and a consolidated total Crown / state owned enterprise view,” said an agribusiness boss. But others were wary this would obfuscate the issue.